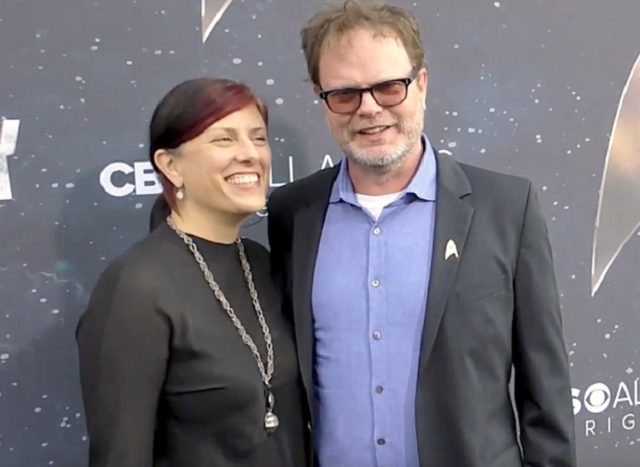 Rainn Wilson, an American actor, comedian, and writer started his early acting career in the theater, earning three Helen Hayes Awards nominations for Best Supporting Actor for his work at the Arena Stage. He moved over to the big screen in 1997, appearing first in an episode of One Life to Live and later, in a supporting role in the 2000 TV film, The Expendables. He landed his most notable role as Dwight Schrute on NBC’s American version of the comedy sitcom, The Office, which ran from March 24, 2005, to May 16, 2013. For his performance in the sitcom, Rainn was nominated three years in a row for Emmy Award’s Outstanding Supporting Actor in a Comedy Series. Born as Rainn Dietrich Wilson on January 20, 1966, at the University of Washington Medical Center, Seattle, Washington, the talented actor/comedian is of Norwegian descent. He studied at Kellogg Middle School before moving on to Shorecrest High School, both in Shoreline, Washington. In Shorecrest high, he was a member of the school band and played the clarinet and bassoon. Before his graduation, his family moved to Wilmette, Illinois, to serve at the Bahá’í National Center and there, he continued his high school education at New Trier High School from where he later graduated. Moving forward, Rain Wilson enrolled in the University of Washington in Seattle and graduated in 1986 with a BA in drama. He continued his Graduate Acting Program at the Tisch School of the Arts section of New York University and graduated with a Master of Fine Arts in acting. As a member of The Acting Company in New York, he acted in theatrical productions and also drove a moving van in other to fend for himself. With a net worth estimated at $14 million, the entertainer surely living a good life. Apart from acting, which is his main source of income, Rain Wilson is also earns money from other ventures. He is the founder of the website and YouTube channel, SoulPancake. As of March 15, 2019, the YouTube channel has more than 3 million subscribers and over 522 views. As a writer, he co-wrote the book SoulPancake: Chew on Life’s Big Questions and also has to his credit, a humorous memoir titled The Bassoon King: My Life in Art, Faith, and Idiocy (2015). Rainn grew up in the Baha’i Faith, a religious group whose beliefs address essential themes such as the harmony between religion and science, the importance of education, the oneness of God and religion, the fundamental equality of the sexes, among many other themes. According to the actor, these beliefs helps one to see the world as one family and not get lost in the traps of political, social, and economic belief systems which tend to lead one astray. Despite being born into the Baha’i Faith, Rainn Wison stepped away from it at age 21 when he was attending acting school in New York. Speaking with the U.S. Baha’i News in 2007, he explained that he was going through a rebellious phase at the time and needed to embark on a spiritual journey in a bid to truly understand his faith. At the end of the journey of individual investigation of truth ten years later, Wilson’s findings led him back to the Baha’i way of viewing things and delivered him from years of alcohol and drug abuse. The actor’s wife, who was not a Baha’i at the time they got married, also joined the faith in 2004 and Wilson says he never pressured her into it. According to him, she became interested in the religion after she started attending Ruhi (a curriculum based on the Baha’i Writings) classes in the L.A. area. The actor tied the knot with writer Holiday Reinhorn in 1951 in a Baha’i ceremony which took place on the Kalama River, Washington. Born and raised in Portland, Oregon, Holiday, a graduate of the Iowa Writers’ Workshop, is known for her short stories which include Big Cats, published in 2005. Rain Wilson and his wife met at the University of Washington, in an acting class and after they got married, they waited for nine years before they had their first child, a son named Walter McKenzie Wilson, in 2004. The couple has two homes – one outside Sisters, Oregon and another in Los Angeles. In addition to his wife and son, other members of the actor’s immediate family include 3 pit bulls (Oona, Pilot, and Diamond), 2 pigs (Snorty and Amy) and a zonkey called Derek. His other family members include his parents; Shay Cooper (mother) and Robert G. Wilson (father). His mother was an actress/yoga teacher while his father, a business consultant, was also an artist and novelist credited with the novel, Tentacles of Dawn. Though born in the United States, Wilson moved to Nicaragua with his father and stepmother, Kristin, when he was only three years old but they later moved back to Seattle after his dad divorced from his stepmother. The light brown haired Rainn Wilson is reasonably tall although it is not immediately noticed at first glance. He stands at 6 feet 2½ inches (188 cm) tall and weighs 84 kg (185 pounds). He also has blue eyes. In October 2017, The Office star announced that he and his wife had adopted a new eating habit – vegan diet just for a month in order to give their digestive system a break from having to deal with animals and animal products. He made the announcement on Instagram, assuring his fans that he will not be one of those vegans who always talk about how they are vegan.